Poetry and ice cream: two of my favorite things. I ended up highlighting quite a few quotes in my copy of The Ice-Cream Makers, particularly about poetry. Giovanni Talamini* discovered his love for poetry during his teen years. Much to his father's consternation, Giovanni wanted nothing to do with the family business, a long held tradition his great-grandfather had started in following his own dream. Giovanni's dream, however, took him in a different direction, and it caused a big rift in his relationship with his family. Giovanni constantly questions his decision in life, giving up tradition to travel and follow his passion. When his brother, married to the girl both he and his brother had a childhood crush on, asks him for a life-changing favor, Giovanni has a difficult decision to make. It also makes him realize just how much he sacrificed in following his dreams. As Giovanni recounts his and his family's story, the narrative takes readers back and forth between past and present. He introduces us to his great-grandfather who worked hard alongside his own father and would eventually discover a love for making ice cream. Guiseppe spent hours perfecting the perfect ice cream, getting the texture and taste just right. He experimented with different flavors and impressed those around him with his skills. It was a legacy he would pass down to his own son who would then pass the family business onto his son. When Giovanni decided to go down his own path, he left behind his younger brother who seemed to take pride in making ice cream. It never crossed his mind his brother might have had other aspirations. As it was, Giovanni's father's heart seemed divided between the family business and his love for invention. 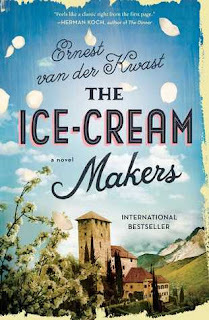 The Ice-Cream Makers got off to a slow start for me, but I eventually settled into the rhythm of the narrative and was caught up in the story and in the lives of the Talamini's. I think most of us as adults know the struggle between obligation and following our dreams, especially as we get older and have families to support. I was raised by a hardworking father who believed in doing whatever it took to put food on the table. He was the kind of guy who would put up with a job he didn't care for if it meant bringing financial stability to his family. There was no family business to carry on, but if there had been, I imagine he and Giovanni's father would share similar views. I admire their steadfastness and their strong work ethic. That isn't to say Giovanni isn't hardworking--he is. Just not in the way his father and brother view it. They work with their hands and labor for hours at a time. It is a different type of work, but not less valuable to those they service. Giovanni knew he wouldn't be happy making ice cream all his life, and so he decided to follow his own dreams, something which I think takes a lot of courage. The bigger the divide between Giovanni and his father and brother became, I longed for them to see themselves in each other: to recognize the art and poetry in ice-cream making and the hard work and sacrifice that went into the work Giovanni did. I enjoyed my time spent in Italy and the Netherlands; Ernest van der Kwast brings it all to mind so vividly. I found the various stories about how ice cream came into being and how it was transported and sold fascinating. Flavors I never imagined were mentioned, some more appealing than others, but I longed to be the one able to taste test their creations. The references to poets and poetry won me over as well. I could relate to Giovanni's love for poetry and just how much it moved him. To be able to travel the world like he does--I can only imagine! I was quite moved by The Ice-Cream Makers in the end. I think this would make a great book club pick, whether to discuss legacy versus desire, family ties and conflict, or the consequences of the choices we make. *My copy of the book (which I cross checked with Amazon's sample and the one on the author's website to verify as the name used in the novel) used the surname "Talamini," but the description on Goodreads, Amazon, and the publisher's site use "Calamine." You can learn more about Ernest van der Kwast and his books on the author's website. He can also be found on Twitter. It's usually a good sign when you highlight a lot. Sounds like a wonderful book. I've always loved having a job. I begged to do yard work and started mowing the lawn at 7. lol. I worked at my grandparents office at a young age and loved it. Some great memories. That title alone captures my attention! And the premise sounds interesting, too. Thanks for bringing this book to my attention, Wendy. Melody - The title is what first drew my attention to it. :-) It was a bit heavier than I expected initially, but a worthwhile read. I can tell you enjoyed this one so I'll have to check it out. I am not really much of a fan of poetry but I do like the sound of this book. I like that this was about a man following his own path in the world. Sounds like a good read. Lark - I enjoyed this one quite a bit. It does sound like it would be a good book club pick, or a good discussion book. And the little details of ice cream would be interesting too, I would think!Glad this worked despite the slowish start. Greg - I think so. I can see a good discussion coming out of this one. Sounds like a good book! I'll have to see if the library has it - thanks so much for the review! Eustacia - I hope your library does have it! What a combination. :) Ice cream and poetry are high on my list, too! This sounds like a book that would have a slow start but one worth sticking with. I love the combination of ice cream and poetry and the family dynamics. This sounds like a fascinating read and a touching one as well. Katherine - Yes, it was worth it in the end, although it was slow at first. I almost passed it up, but am glad I decided to give it a try.